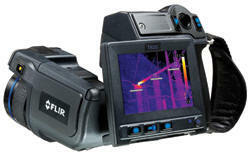 CAMM specializes in Thermal & Infrared testing. From finding water leaks, air infiltration in walls, to insulation inefficiency you can feel confident that your inspection will cover what can and cannot be seen with the naked eye. Your house may be insulated, but that does not mean it is properly insulated. Many times, the insulation contractors are not professional and don't know how to properly install the insulation. Thermal imaging can not only find the areas of improper insulation but also water and moisture intrusion areas as well as places where cold air is blowing through insulation and through electrical receptacles.